Charity fundraising is a serious business. Unless, of course, the organization in question is Red Nose Day. Known to British citizens and the Anglophiles who love them for decades, the biennial event encourages every day folks and celebrities alike to “cast inhibitions aside, put on a Red Nose and fundraise,” according to the official website. Founded by filmmaker Richard Curtis of “Notting Hill” and “Love Actually” fame, Red Nose Day is making its way to the U.S. for the very first time on May 21. As is the case in the U.K., Red Nose Day culminates with a live benefit show that will be televised on NBC. The star-studded night of comedy and musical performances will include some of the biggest names in entertainment including Julia Roberts, Will Ferrell, Jennifer Aniston and Christina Aguilera. The show will also include pre-taped segments of stars who accepted challenges that spotlight the 12 charitable organizations that will benefit from the big event. In a recent conference call interview, actor-comedian-musician Jack Black talked about his life-changing experience on a trip to Africa for Red Nose Day. 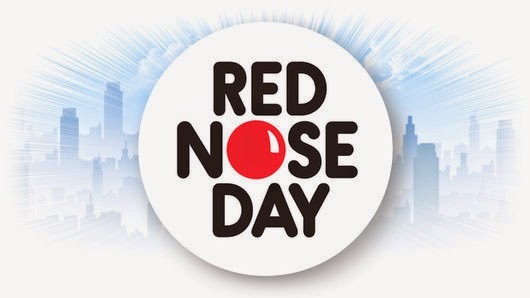 To find out how you can make a donation visit the Red Nose Day website. Download the Red Nose Day app to get in on the action. And tune in to the Red Nose Day special on Thursday, May 21 at 8 p.m. EST/PST on NBC.